Back in the good old days of 2014 (oh, how time flies!) 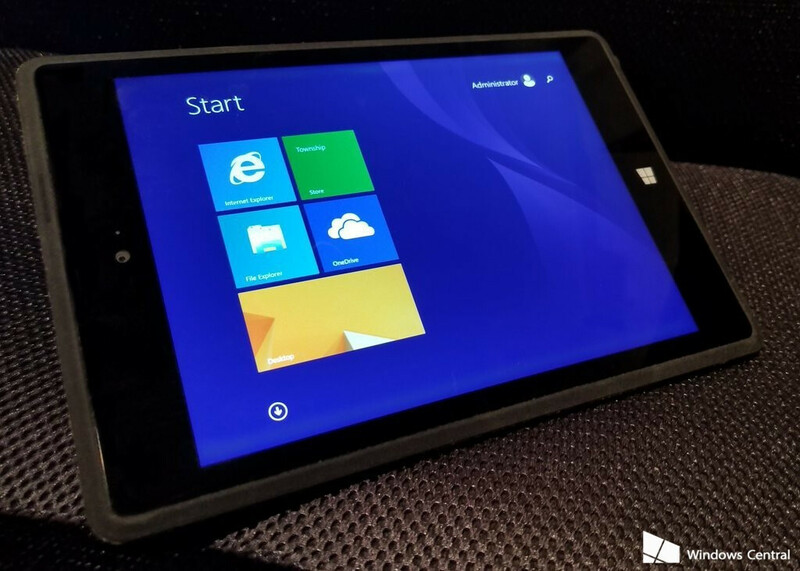 Microsoft was setting up for a launch of not just one, but two tablets running its Windows RT operating system — the Surface Pro 3 and the Surface Mini. But for one reason or another, the latter of the two got scrapped at the very last moment, as CEO Satya Nadella had little confidence in its success in the crowded small tablet market. But while we've heard official confirmation of the device's existence, we've never actually seen a prototype in action — until now, that is. Pictures obtained by Windows Central show us what the device could have been, and it's fair to say its design hasn't aged that well. That is to say, The entirety of the Surface Mini's body is covered in a felt-like material, similar to the one found in the recently released Surface Laptop. And while that is good in theory, the material doesn't seem to have stood the test of time, with its edges being visibly worn down. The device has a built-in kickstand, just like its bigger brother, the Surface Pro 3, but also features huge bezels which make it a bit unsightly even by 2014 standards. It also supported the Surface Pen as an input method, which would have been a nice addition to the smaller form factor of tablet. Its screen was an 8-inch panel which sported a 1440 x 1080 resolution. Inside, you would find a Snapdragon 800 SoC with 1 GB of RAM; and if a Windows machine running on an ARM processor raises a few eyebrows, it's worth mentioning that the now-dead Windows RT was designed specifically for ARM devices. Also, that it was terrible. Really, with the tablet market being the way it currently is, it's easy to see why Microsoft wouldn't be doubling down on its involvement — sure, the Surface Pro still exists, but a second line of tablets would have been extremely unlikely to succeed. Still, it's fun looking at pictures of old devices and fantasizing about what could have been, right? I heard panos panay still uses this gem. He said that the only reason they didn't release it is because it wasnt game changing like the surface pro, surface book and the surface studio. This bold move in itself gives me high hopes for the surface phone, as it only means one thing .... IT WILL BE GAME CHANGING. The term "phone" is silly these days. The only thing that makes it different from any other device is that it's compact and has cellular. But it wasn't always compact nor was it always smart. So the term phone is really just about cellular. And if MS brings cellular to all pc devices. It will no longer be about a phone but a cellular device. From pocketable to laptops, to anything. I think everyone is overlooking a major point in regards to this cancelled mini tablet. The SD 800 came out in 2013, and was only 32 bit. So naturally this was running Windows RT. Just like Microsoft's​ Surface and Surface 2 both of which were running Windows RT. Even Microsoft stopped selling their Surface devices (Windows RT) as of January 2015. It would have been DOA if Microsoft released it. Everyone knows that Microsoft wrote off close to a billion dollars because of their Windows RT devices. I'd like to see the Surface Phone come to fruition. "Microsoft was setting up for a launch of not just one, but two tablets running its Windows RT operating system — the Surface Pro 3 and the Surface Mini" the Pro line never ran RT. the only Surface tablets to run RT were the 1st and 2nd gen. If it's not about Apple don't expect this website to be accurate. I think it's a good thing they didn't release it. Not only would it have been DOA with Windows RT, but the vast majority of Windows taks just aren't practical on such a Small screen, 10" display is the minimum IMO...maybe with it extended to a second screen it'll be suitable, but you'll be stuck at your desk.